Costas E. Synolakis (BS ’78, MS ’79, PhD ’86) obtained all of his degrees from Caltech, starting with a BS in engineering and applied science that was followed by a master’s and PhD in civil engineering. Currently, he is a professor of civil and environmental engineering at the University of Southern California (USC) Viterbi School of Engineering and the director of the USC Tsunami Research Center. ENGenious sat down with him to learn more about his time at Caltech and its impact on his career. ENGenious: What inspired you to be an engineer? Synolakis: A desire to solve real problems. I was totally intrigued as a kid by all the mechanical things around me. I thought that engineers spend their time designing new things and putting together things that helped people make their lives easier. Synolakis: It gave me the fundamental background to really understand what are the big problems versus the small problems. One of the most difficult things for me as a teacher is to help students understand what is important in the problem and what is less so. At Caltech we learn critical thinking—how to take a real physical problem and abstract from it the parts that we can solve and that can give us useful results. I try to teach it in my classes at USC, but at Caltech, you get bombarded by it. ENGenious: How did you come to work on tsunamis? Synolakis: My Caltech advisor, Fredric Raichlen, Professor of Civil and Mechanical Engineering, Emeritus, was a very enthusiastic proponent of studying the basics of waves, which I did, but what really attracted me were the experiments we did together with really long waves, which were models of tsunamis and held the promise that we could understand how they evolve. 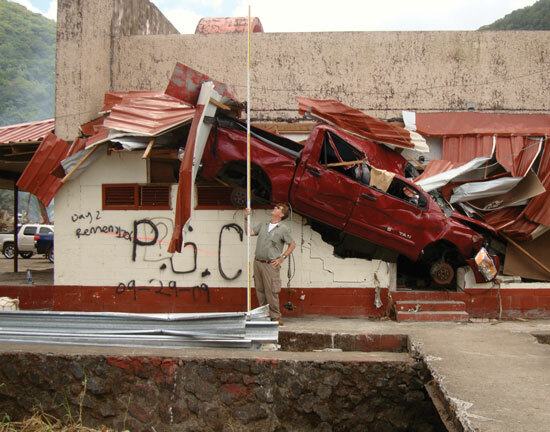 Unfortunately, when I graduated from Caltech in 1986, nobody in funding agencies was interested in tsunamis, until a medium-size tsunami hit Nicaragua in 1992. I went there because I thought this was my lucky break in science: I was going to see the impact of a real tsunami, possible the only one. Others had been studying tsunamis for three decades but had never seen firsthand the impact of a tsunami. Suddenly tsunamis started being reported about once a year, and by serendipity and good luck, I jump-started the science of tsunami surveys and showed how, by studying the impacts and the aftermath, we could make useful and targeted evacuation predictions, in many cases faster than the arrival of the waves. This went hand in hand with advanced numerical modeling, and simple paper-and-pencil-type results developed from applied math tricks I learned at Caltech. My greatest contributions, going back to my lab work with Fredric Raichlen, are the tsunami forecast codes and the early-warning methodology, now in use by the tsunami warning centers in the U.S. and most of the world. We had many different directions and false leads early on, but we finished “first” among what ended up as fierce competition, because at Caltech we learn to identify what is important. What is the first-order effect? In a tsunami, the first-order effect is what kills people, but believe it or not, we were the first to focus on overland flow depths and currents. Today, if you go on the beach anywhere in California, you will see tsunami evacuation signs, all based on my lab’s work. ENGenious: What is a typical day for you? Synolakis: Tsunami fieldwork is very much like detective work. It is as if you are at the scene of a crime against humanity, and we just know vaguely the perpetrator. But we also have to convince local authorities to help out; sometimes they want to hide evidence out of shame or because they think they can use it better than the world community can. Fieldwork for natural disasters is not altogether different from studying the aftermath of the Malaysian Airlines flight blown out of the skies over the Ukraine. We need to understand how it happened and what steps we need to take to prevent it from happening again. We can’t prevent people with missiles from shooting down planes, but we can make sure that planes fly out of harm’s way and learn how to better understand when the threat is real. I spend a lot of time interviewing people and do quite a bit of social science and outreach work pondering questions such as: Why do some people evacuate right away while others wait? Why do some communities fare far better than similar neighboring communities that faced similar-size waves? What information do broken clocks showing different times or multiple water marks in the same affected area convey? What do burns on victims’ bodies tell us about what took place, when we know there was no fire? ENGenious: Is there a particular incident that comes to mind as an example? Synolakis: The death toll in the 2011 Tōhoku, Japan, tsunami was small in comparison with the size of the wave, but far more people died than one would have hoped or expected in what was thought of as the most tsunami-ready nation in the world. For example, there was a two-story school in the Sendai plane in northern Japan, about a mile inland from the shore. The earthquake took place. The students, who took classes on the second floor, were taught to evacuate outside in the case of an earthquake, and they did so. Ten minutes later, they heard the tsunami warning and went back to the second floor. Then they felt shaking and again evacuated the building. But the tsunami sirens kept going, so there was confusion. Some students went back to the second floor; others stayed in the courtyard outside. When the tsunami hit, it was the students who stayed on the second floor who survived; the others died. This is precisely the type of tragedy we need to better understand. The accident at the Fukushima nuclear power plant was a cascade of avoidable errors. To wit, a nuclear plant about 100 kilometers north of Fukushima survived unscathed, yet local flows there were of similar intensity as in Fukushima. Sadly, introverted societal structures influence engineering decisions and sometimes even education, and some engineers do not worry enough about the possible fates of their designs. To paraphrase a common maxim, engineering is about exploiting natural phenomena (anything from the photoelectric effect to wave energy) for useful purposes; great engineering is about working with nature versus antagonizing it. ENGenious: Has there been a mistake that was critical to your progress and success? Synolakis: Yes. I used to think that tsunamis look like solitary waves, which are single-hump waves that can be described elegantly with math. This was the prevailing model, and this is what I did my PhD thesis on. But we had no idea what tsunamis really looked like, and this is where the fieldwork comes in. In the field, I heard people describing firsthand how the shoreline retreated first, before the final impact, consistent with tsunami folklore. For years I had thought that because we had the mathematics and the experiments, we had it all perfect. Well, if you had a wave that looked like a single hump that propagates, that would cause a shoreline to advance first. Always. It wasn’t until 1992 that I finally decided to go back to the drawing board. I developed a model to explain why this happens, and it showed that the tsunamis are dipolar waves, just as the seafloor motion that causes them. The part of the seafloor that uplifts causes an elevation wave; the part of the seafloor that subsides causes a depression wave. The depression wave propagates toward the beaches of the adjacent mainland and causes their shorelines to retreat first. A key part that was missing in earlier analyses was that in every tsunami disaster, if you are closer to the subsiding seafloor, the nearest shoreline will always retreat. Farther away and depending on where you are, you will experience different manifestations of the tsunami. So I threw out the solitary-wave paradigm. The publication of the hypothesis in Physical Review Letters was controversial, to say the least. Even my own advisor did not agree with me at first, as practically all the other senior people in the field did not. What I was saying was different from the zeitgeist, yet most knew intuitively that I was right. With the 2004 tsunami, my hypothesis was confirmed. In locales east of the earthquake zone that triggered the tsunami, such as Indonesia, Thailand, and Malaysia, people experienced the depression wave first, whereas on the other side of the earthquake zone in India, Sri Lanka, the Maldives, and East Africa, people experienced the elevation wave first. I was happy that I was able to clear up the confusion. I used to preach that tsunamis were single-hump waves; now that they are dipoles, this makes them a bit more difficult to predict. Part of the classic Caltech education is learning not to be hooked to any particular model, and when new observations contradict your pet hypothesis, to throw it out or reformulate it to account for the new data—to never ignore outright what doesn’t seem to fit. ENGenious: What advice do you have for the next generation of Caltech engineers? Synolakis: Think in terms of the really big picture, even in nano-worlds, and worry about the details later. It often takes quite a while to know what’s important, but always keep the big picture in mind. Learn how to meaningfully exploit nature, in a sustainable way if on a large scale, but never fight it. Costas E. Synolakis is Professor of Civil and Environmental Engineering at the University of Southern California (USC) Viterbi School of Engineering and Director of the USC Tsunami Research Center.